As part of our platinum sponsorship with NFTS, ODEON gives a scholarship to an MA student/s with preference going to an ODEON colleague. In 2017, three lucky students will benefit - Ben Hunter (Directing Fiction MA), Lydia Rynne (Screenwriting MA) and former ODEON colleague, Zsófi Szemerédy (Marketing, Distribution, Sales & Exhibition MA). Zsófi was a cinema host at BFI IMAX and Panton St before she started her studies. We met with this year’s recipients of ODEON scholarships and asked what the support meant to them and why they chose to study at the NFTS. How much does it mean to you to have been given a place at NFTS to study your course? Ben: I am thrilled to have been accepted onto the two year Directing Fiction MA at the prestigious National Film and Television School. I am the only Scottish student and am joined by seven other students from across the world. This is a unique and specialist Masters course which will allow me to develop my creative voice as a director in an intense and practical environment. The opportunity to build my network and learn from masterclasses with industry talent such as Roger Deakins, Danny Boyle, Christopher Nolan and Sally Wainwright is absolutely incredible. To know you have been selected from over 3000 applicants to study at what The Observer described as, "The world's best film school" heightens my motivation to make the very best contribution during my time studying there. This will be my foundation to entering the industry. Lydia: I had been (just about!) managing to fit writing into my spare time for many years, but the idea of leaving my job and following the dream was daunting. When I was offered a place at the NFTS, a film school I knew was ranked as among the best in the world, I knew I had to grab the opportunity with both hands. To be working alongside so many talented peers, and learning from practicing filmmakers, is incredibly inspiring. Zsófi: It was my dream to study at the NFTS for years. I heard two years ago, while working at ODEON Leicester Square (OLS) that ODEON became a sponsor of the NFTS and I was over the moon! I’m studying on the Marketing, Distribution, Sales and Exhibition MA, which is a brand new discipline at the School and highly supported by the industry. I’m thrilled to be here, as I’ve been working in this line of the industry for years and used my time at OLS to practice my marketing skills, which being an event venue was a great experience. I also worked for Premier PR during the London Film Festival season, and they do a lot of red carpet work at OLS. It was fantastic to see a different side of the exhibition industry from press conferences to organizing premieres. My ambition is to distribute sci-fi and fantasy films and to open my own production house with an in-house distribution arm. How important is the support you have received from ODEON? Lydia: Without this scholarship, it is highly unlikely that I would have been financially able to take up the offer of a place at the NFTS. The ODEON's generosity has given me the opportunity of a lifetime, to focus fully on becoming the best screenwriter I can be, without financial strain. Zsófi: ODEON’s support has meant that I can pursue my dream and the industry doors that otherwise would have been closed for me are now wide open. My colleagues at ODEON have always supported and encouraged me throughout my time there and I am hugely grateful for their help and motivation. Ben: Without the assistance from ODEON, I would not have been able to accept my place on the course. Their belief in me has pushed me to be the best I can be. What are you enjoying the most about your experience at NFTS so far? Zsófi: I am loving every second of it; it’s very hands on! I’ve already been to a preview screening at Fox with Gore Verbinsky and I’m going to a BAFTA event next week as well as visiting the BFI and the Film Distributor’s Association. The best thing about NFTS how distilled it is. Everyone who is here wants to be here and fought their way in. You have to be dedicated and focused. It’s a pool of like-minded people who want to follow their dreams and realise them into career aspirations. Ben: The NFTS is an intense and practical environment full of like-minded passionate filmmakers eager to express themselves. On the Directing Fiction course we have been thrown in at the deep end and have already been shooting scenes with professional actors just one week into the course. I cannot wait to collaborate with each discipline to create the first of the many films we shoot throughout the two years here at the NFTS. 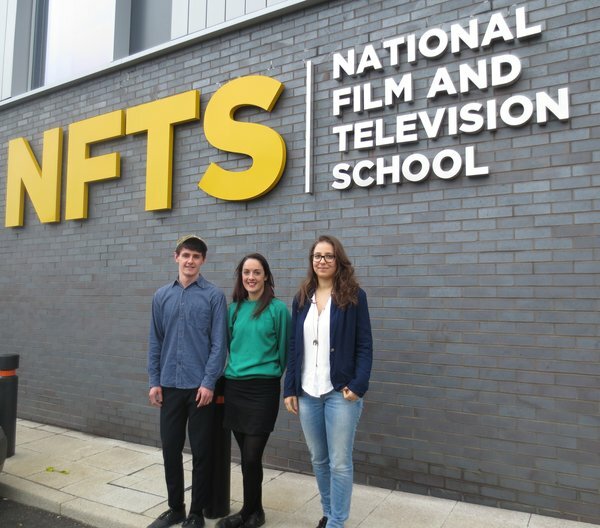 Lydia: The first few weeks at NFTS have been an amazing whirlwind. I have met so many people who I know I will collaborate with in years to come. This is a hugely comforting and exciting prospect. I am particularly excited to begin working with the fiction directors and also animation department on bringing new worlds and stories to life.